This meal will take you 25 minutes to make, start to finish. Prep time included. I felt the need to state that right off the bat. 25 minutes! For a delicious home cooked dinner! One thing I never hear people say is, “You know what I need? I need some complicated recipes that take a lot of time to make. And they should have really long lists of ingredients too!” No, everyone wants easy. Not Taco Bell easy, but who wants to come home from work and spend 2 hours cooking dinner? No one! I’m a food blogger and cooking is kind of my job and even I don’t like spending too much time on one meal. So this recipe is simple. And there aren’t many ingredients either. (Woo hoo!) Although I made this with whole wheat rotini, you can use any kind of pasta you have on hand. If you don’t want to buy broccolini, use a crown of broccoli instead. You can sub out the pine nuts with walnuts or almonds. This recipe is agreeable like that. Do you have a favorite quick, easy vegetarian recipe? Share it in the comments below–links are welcome! An easy, delicious pasta dinner that’s ready in about 25 minutes. If you can’t find broccolini at your grocery store, use a crown of broccoli instead. Cook rotini according to instructions on package. One minute before cook time is finished, drop broccolini into pot. Drain and set aside. Heat olive oil in a large skillet over medium heat. Add garlic and cook for about 2 minutes, until fragrant. Stir in pine nuts and red pepper flakes (if using) and cook about 2 minutes more. 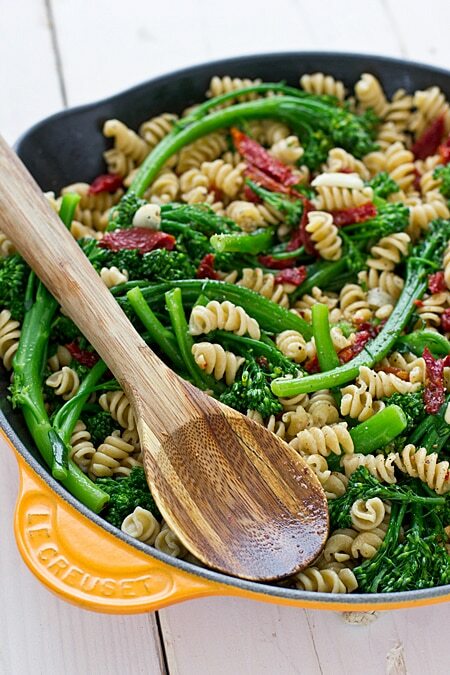 Stir in sun-dried tomatoes, pasta and broccolini, and season with salt and pepper. Remove from heat. Divide into bowls and garnish with shaved Parmesan cheese. This looks fab! I bet it would be good with Asparagus too! I love broccolini! This looks so good, Kiersten! Oh this is so my kind of meal! Love that color! 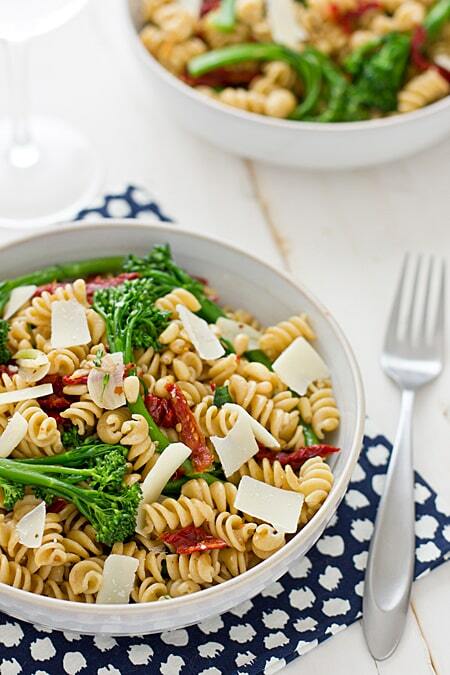 I’m all about quick and easy and have been seriously obsessed with broccolini lately! Oh man this pasta looks so beautiful and full of color! I could probably sit down and eat an entire bowl (all 4 servings) of that! Will definitely try it out! Yum! I love broccolini. It’s super hard to find here, so most often I have to sub in just plain old broccoli, but if I do manage to find it I’ll buy up as much as I can and go crazy on the stuff! This pasta looks so simple yet so tasty. A definite win for a quick weeknight dinner! This looks so filling and colorful! I used to take a bunch of night classes and figuring out dinner was such a pain on those nights! Now this is a pasta I could never get tired of. It looks incredible! Super simple and delicious! I’m definitely throwing this, along with those amazing broccoli & cheese pot pies, into the rotation ASAP!